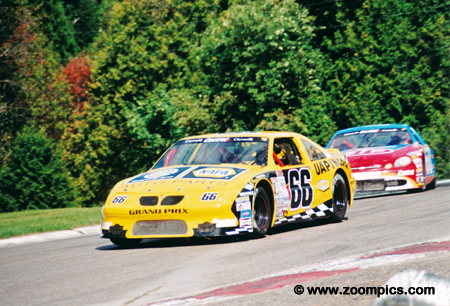 Canada’s premier stock car series in 1998 was the Canadian Association for Stock Car Auto Racing (CASCAR). It proved so popular that there was an East and West series and a National Super Series. The Western Division had nine-race weekends and the Eastern series eleven-events. The National Super Series consisted of four events two selected from the Eastern and Western schedule. A large part of the series success could be attributed to the year-end points fund. Competitors in the National Super Series were competing for their share of more than $1.25-million dollars in cash and awards. 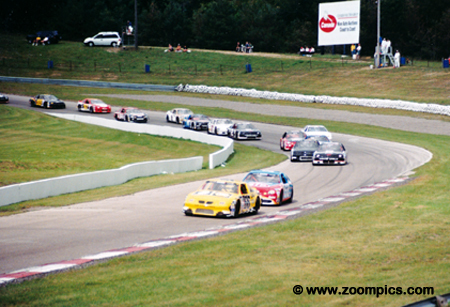 The 1998 Canadian Auction Group 300 KM (75-laps) at the Mosport road course was one of the National Super Series events and also counted towards the Eastern Series championship. Due to its status, it attracted a number of western Canadian competitors. 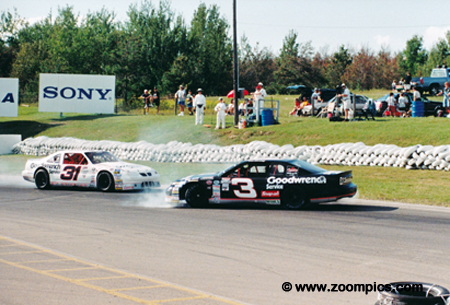 In 1998, there were only two road course events – as mentioned Mosport and the Edmonton City Centre Airport. 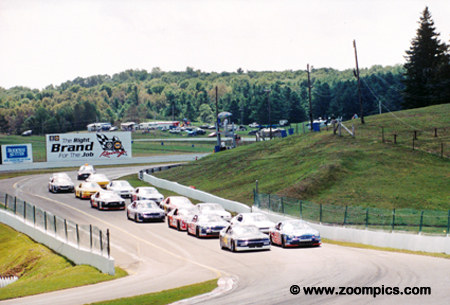 This was the series first visit to Mosport in several years. The event proved popular and it became an annual stop on the series schedule. The leaders, Robin Buck in a Pontiac Grand Prix and, in close pursuit, Scott Maxwell in the Ford Taurus, exit corner one. In this lead pack is Dave Whitlock the 1991 and 1997 series champion. 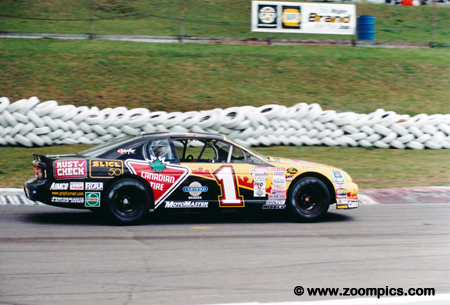 He started the Mosport event in eighth and finished seventh. On the strength of this finish, Whitlock jumped ahead of Peter Gibbons in the championship hunt and would go on to win the 1998 title. 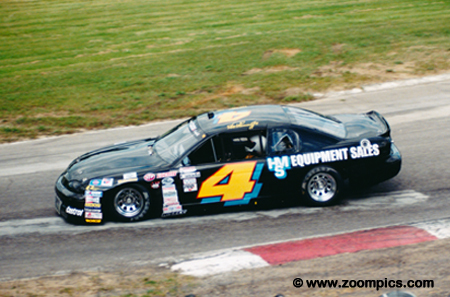 Most CASCAR drivers began their careers on small local ovals - as for road course experience most had little to none. Road racing specialists were at a distinct advantage and this was the case with Scott Maxwell. A big setup change by the team Saturday evening contributed to him winning his first CASCAR race. 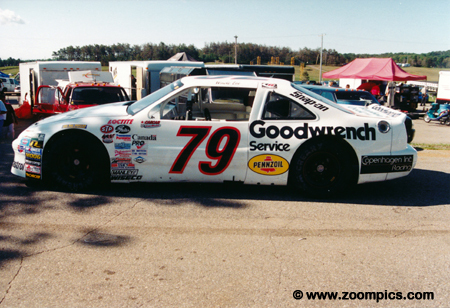 On the pole for 300-KM race was Robin Buck driving a Pontiac Grand Prix. The road courses favoured Buck as his early motor racing experience was as a successful competitor in Formula Fords. Buck diced throughout the race with Scott Maxwell and ultimately finished second. Heavy contact with Maxwell in turn two on lap-65 damaged his suspension and ended his chances of winning the race. The No. 79 Pontiac Grand Prix was driven by Western series competitor Wade Lee. Lee had extensive road racing experience having competed in the Canadian F2000 series. At the Mosport round, he qualified twelfth and finished fourth. Lee captured the 1998 Western CASCAR title which would be his third in 4-years. Peter Gibbons drove the No. 1 Chevrolet Monte Carlo. He started in the fifth spot but on the fourth lap he went behind the pit wall to change a bad clutch. He returned and only completed 29-laps which resulted in a twenty-eighth finish. 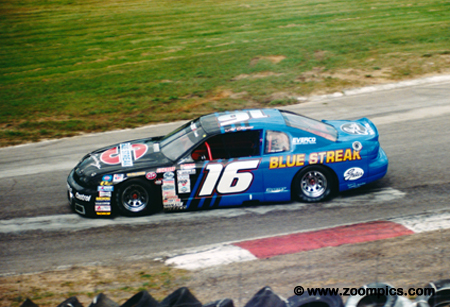 Gibbons was the 1994 CASCAR Rookie of the Year would go on to take the National Super Series championship in 1999 and 2000. Dan Shirtliff in the No. 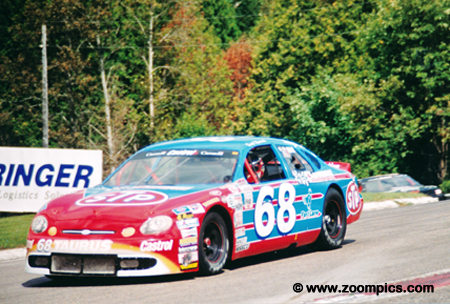 3 Chevrolet Monte Carlo and the Pontiac Grand Prix of Kelly Williams tangle in Mosport’s final turn – both drivers were able to continue. Williams who qualified nineteenth would finish twelfth. Shirtliff would finish thirteenth after starting in twenty-fifth spot. Don Thomson Jr. drove the No. 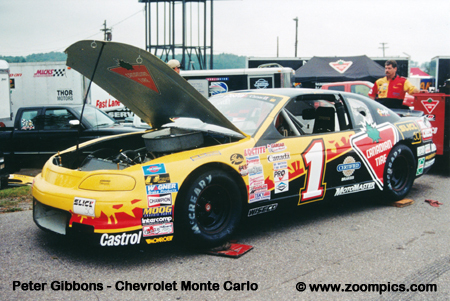 4 Chevrolet Monte Carlo and in 1991 won the last CASCAR event at Mosport. He started second and ran a distant third to Maxwell and Buck. He was forced to pit on the thirty-sixth lap with a differential problem and accounted for his fifteenth place finish. Thomson had very successful CASCAR Super Series career winning the title five consecutive years – 2001 – 2005. He also had the distinction of winning the first Canadian Tire NASCAR race in 2007. On Saturday of the race weekend, there were two qualifying races which were 25-minutes in length. One of the groups on their pace lap approaches corner 10. The qualifying heats were important as they not only determined the starting grid for the final race but also contributed to a year end points total. Buck and Thomson Jr. were the winners of Saturday's heat races. The No. 16 Chevrolet Monte Carlo was driven by Al Turner. Turner was in an intense battle with Wade Lee and out-braked Lee at the end of the back straight on the last lap. He finished third after starting eleventh.